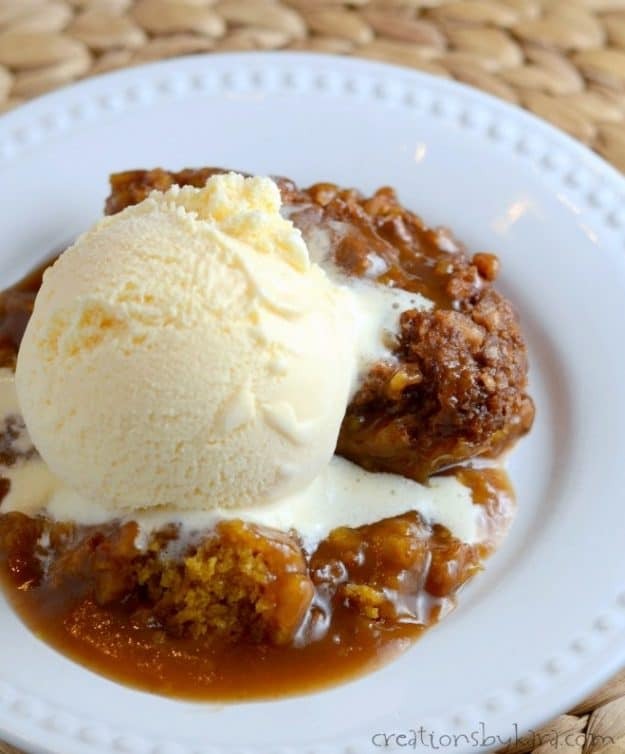 Pumpkin Cobbler – this yummy pumpkin dessert is so easy to make, and tastes just like fall. It is absolutely incredible with a scoop of vanilla ice cream! I adapted my recipe for Hot Fudge Pudding Dessert to come up with this yummy dessert. It’s seriously delicious. I actually made this recipe earlier this year. March I think. But by the time I got the photos all edited, warm weather was just around the corner, and I knew no one was thinking about pumpkins anymore. So I decided to wait to share it. It was so delicious, I can’t wait to make it again! Honestly, the first time I made it I wasn’t even sure it would turn out. I’ve never adapted a chocolate recipe into a pumpkin spice recipe before, so I was just crossing my fingers that it would taste as good as I imagined it would. . .
oh. my. word. This stuff is absolutely amazing! 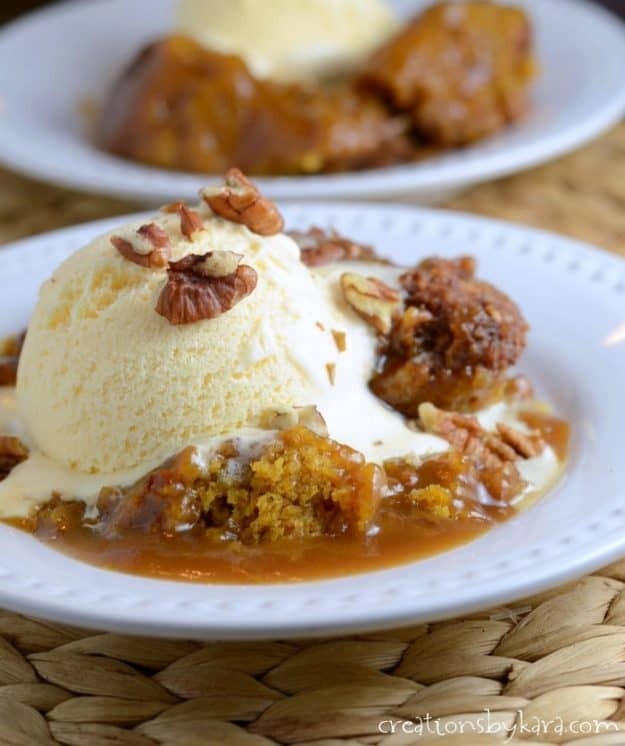 The pumpkin cake is tender and flavorful, the pecans add a yummy crunch, and the caramel cinnamon sauce takes it over the top to make one incredible dessert! It is so easy to make, but looks and tastes simply divine. In case you aren’t familiar with my hot fudge pudding dessert, this may seem like a strange recipe. You spread the batter in the greased pan, sprinkle it with brown sugar, spices, and nuts, then pour hot water over the top. It seems crazy to just pour water on top of your cake, but trust me, it all works out. You don’t need to stir it together. As it bakes, the water and sugars sink to the bottom to form a yummy sauce, and the cake rises to the top. It’s magical! 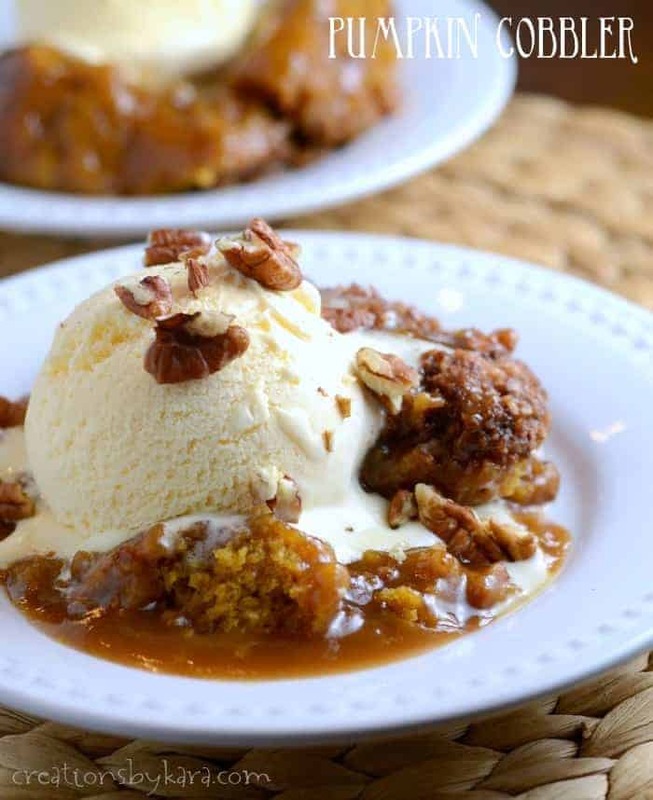 And trust me, you are going to need to serve this pumpkin cobbler with ice cream. So yummy! Whisk together the flour, baking powder, salt, sugar, and spices. Add the pumpkin, oil, and vanilla. Stir just till blended. Spread into a well greased round casserole dish or 9" square pan. Mix together the brown sugar, cinnamon, and walnuts in a small bowl. Sprinkle evenly over the batter. Pour hot water over the top. Bake at 350° for about 50-60 minutes. The cake will rise to the top, it should be cooked through, but there will be sauce at the bottom. This was so good. Do you have any other “magic” recipes? 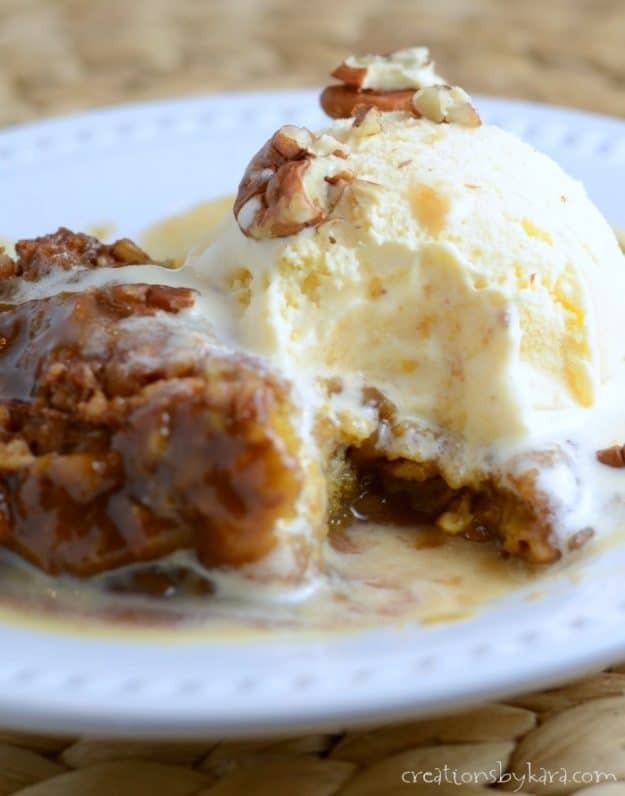 How about toffee sticky pudding? I haven’t made the toffee sticky pudding yet, but it’s on my list! Can I use pumpkin pie spice instead of all the individual spices? If so, what amount do you think? Yes, you can try substituting pumpkin pie spice for the individual spices. I’d use about 2 teaspoons, but you can use more or less depending on your preference. This recipe came out really good! My husband and teen girls loved it! If they wanted it a little sweeter they had the option of caramel but they said it was sweet enough and with the ice cream – perfect! Is it possible or has anyone swapped the pumpkin for mashed sweet potatoes? No, but I sure thought about it though…or mixing the two….The sweet potato should be amazing! I made this recipe today and I loved loved loved it!!!! It is so ooey gooey and the perfect dessert on a cold rainy fall day. It literally hit the spot for me. I added 1/2 cup white chocolate chips, omitted the nuts, and used self rising flour. Served with vanilla bean ice cream and drizzled with caramel sauce. Superb!! I bet it was extra decadent with the white chocolate! Thanks for sharing your variation! Made this and it was absolutely delicious, and magical, hehe As has been said, the cake is meant to be gooey and dense (not fluffy), similar to my baked Indian pudding recipe! For those who say it lacks flavor, just up your spices, and for those who say it’s too sweet, reduce the sugar and/or instead of topping with ice cream, try unsweetened, freshly whipped cream as we sometimes do! Now, I’m SO tempted to try swapping the hot water for cider, reducing the sugar as cider is already sweetened. Thanks so much for a great fall (my fave food season!) recipe! If you try it with the apple cider, let me know how it goes. Sounds delicious to me! I’d LOVE to know how this turns out with cider myself!! If you try it, would you let us know how much sugar you use? I’m not an expert baker, but I’m working on it! I’ll be trying this recipe tonight. Thanks for all the tips everyone! I made this tonight and it was AMAZING! The only differences: I used an 8 inch square pan because I didn’t have a 9 inch square pan, I did add a pinch more of each spice and about a spoonful of extra pumpkin as noted in some of the comments. I topped mine with frozen Cool Whip and it was delicious!! Glad to hear that it worked in an 8″ pan. Thanks for the tip! If the water needs to be really hot like close to boiling, I think you need to say that. We made this and the cake did not rise above the liquid. It came out very dense and soupy on top. We used hot water. MaryAnn, thank you so very much for stopping by and sharing so much fun information! I had no idea that brown sugar was cheaper than cane sugar back then. Sorry that you can’t have dairy, that is a big bummer! Oh, and I love the idea of a peanut butter sauce with the chocolate version. I just might have to try and come up with a recipe for that! Hi this looks delist! Can I replace hot water with hot coffee? I have never tried it, but I would think it would work. It would of course change the flavor, but if you like mocha, that could be a bonus. Give it a try and let me know how it turns out! I just made this and the cake didn’t rise?? All the goo is on top?? Has this ever happened to you. I follow all the directions!! That has never happened when I’ve made it. Sorry you had trouble. I want to make this ahead of time. To reheat, do you think 350° for 15 min would be sufficient? What else do you suggest to keep the gooey texture? I’ve never tried reheating it in the oven, but I would start with 15 minutes and then check to see if it needs more time. It will definitely not be as gooey, because the cake soaks up some of the sauce as it sits. But it will still taste great. Is there a benefit to using the plain pumpkin and adding all the spices vs. just using pumpkin pie filling? I have never used pumpkin pie filling, so I don’t know how it tastes. I know it’s sweetened, so you would also need to omit the sugar. If you try it, let us know how it works! What this idea work with other things. I’d like to make it with cherries. I’ve only tried the chocolate and pumpkin varieties, so I don’t know. It’s not a typical cobbler recipe where you have a layer of fruit and a layer of topping, so that wouldn’t work. But it may work to add some chopped cherries to the dough. You could always try it! Yes! Prepared Filling is made to be Custard & I can guarantee it would be what it should be. Plus plain canned pumpkin last longer. I agree, it is a little strange pouring water over a dessert, but it does work. So glad you liked it! Huge hit! I’ve made it a few times with just a few tweaks. Extra cinnamon, less white sugar in the cake, replace the oil with melter butter and slightly reduce the amount of water on top. It makes for slightly less caramel on the bottom but a fluffier cake which suits me but might not be ideal for everyone. Overall amazing recipe! How much less sugar did you use, I was thinking I would try to reduce some too? Thanks! I made this and everyone raved about what a genius I am. So impressed, this recipe is now a family favorite. Honestly though, I use recipes other than my own as guidelines and do substitutions or aditions depending on the circumstances. I added half and half to the cobbler mixture and added carmel sauce to the top instead of ice cream. Thanks for sharing your recipe. This was way WAY too sweet for my taste. The consistency was very nice, came out fluffy and moist with the Carmel sauce, but not much flavor besides just sugar. Not a fan of this one. I would like it a lot if you had a ‘print’ for the recipe with a picture. This would make my life easier as I print all the recipes I would like to try. Then keep them in my binder if they are terrific! Excited to try Easy Pumpkin Cobbler for my family this Thanks Giving, thanks for sharing your recipes. It would be great to have a pic w/o the ice cream. I’v very visual and need to see how it’s supposed to look when it comes from the oven. Seems like it is delicious. Perfect autumn flavours. This recipe looks and sounds sooo yummy!! I too, would also to see a pic w/o the ice cream on top. I’m such a visual baker….and want to make sure mine looks like it should! I just made this and was disappointed. The cake seemed very dense. The original recipe calls for milk. Do you think that could be the problem. I’m not a novice at baking as I bake almost every day for my daughters restaurant. I would not be happy serving this I will try it one more time. The cake part should be pretty dense, more like a brownie than a fluffy cake. I actually like it that way because it holds up to the sauce without feeling soggy. But that is just my preference. You could try it with the milk instead and see if you prefer it that way. Good luck! I pinned this like a month ago and just finally got around to making it, and it came out great! My husband and son love it! Have not made your hot fudge cake but that’s next! Can’t wait! Probably tomorrow! Yummm! The original name is Pudding Cake, it’s is Best served still very warm & should be very fudge brownie-like. Not batter-like but very Fudgy & then you spoon the sauce on top. You don’t use milk in it. Definitely water but the water needs to be very hot. We boiled it in the kettle then measured & poured it right on. My Mother would put it in the oven first & pour it only just before closing the door.. It was aprecaution so it wouldn’t, slop & burn somebody. Also so it wouldn’t penetrate though the cake by getting jarred or accidentally stirred by some motion. MA Boston. The first time I made this the cake seemed gummy. Like it ways to done. It baked for an hour. I tried it again and still not thrilled with it. The original recipe called for milk. Do you think that would make a difference. I’m not a novice at baking as I bake most every day. This has me puzzled. This looks awesome . Can’t wait to try . The caramel sauce is that what makes from the baking process or something you add? I made this on Saturday, followed directions exactly except I left out the nuts. It’s delicious!!! Definitely make sure you have vanilla ice cream. Yummy as it melts on warm cake. I agree about the vanilla ice cream. It’s definitely a must with this recipe! It is definitely a little strange to pour water onto a cake, but it somehow works. So glad you enjoyed it! Kara, what canned pumpkin do we use..100% pure pumpkin or use the pumpkin mix ? 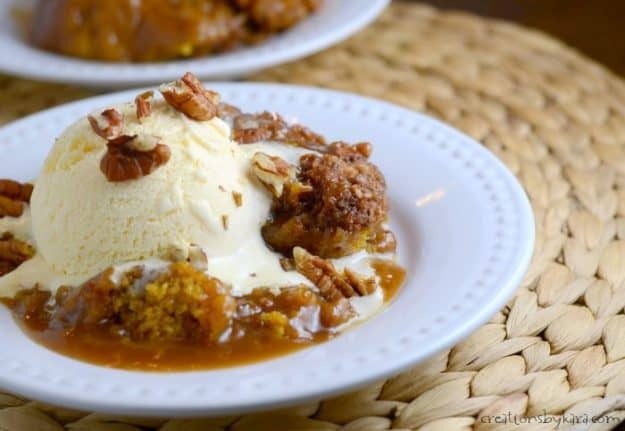 I made this last night to serve to a ladies group– it was delicious — a yummy fall treat– I was skeptical about the caramel sauce — but it turned out wonderful– great with ice cream– about to have some leftovers now– Thanks for the recipe– will def. make again and again. The cake baked up beautifully, with a nice, rich sauce. However, it was reallllllly sweet, even for a dessert. I may try the recipe that inspired this one, which looks like it has much less sugar. I’m not a fan of nuts in dessert but I DO love streusel. Could I sub the nuts for oats/butter or put a strussel on top at end of baking, then bake a few more minutes? If you don’t like nuts, you can just leave them out. I’m not sure how it would work to add the streusel at the end, the additional cooking time would probably dry out the cake and sauce. You could certainly try it though. Can you use fresh pumpkin puree instead of canned pumpkin? Yes, you can absolutely use fresh pumpkin puree! Can this cook in s crock pot? I haven’t tried it in the crock pot, but I bet it would work. Im allergic to cloves and ginger. Otherwise this look awesome! Can you recommend a substitute for me?? You can just add additional cinnamon and nutmeg, and it should still be delicious! Maybe try fresh spices – mine turned out amazing and the spices came through perfectly. when baked does this recipe turn out with a cobbler consistency of crust and filing? Or is it more like a gooey pumpkin cake with a Caramel sauce? It basically turns out like a really moist cake with a caramel sauce. Hello! This looks delicious and am planning to make it for Thanksgiving. How much water would you estimate you pour over the top? Thank you! If you make the recipe as stated, you use 1 1/2 cups. If you make half a recipe, you cut all the ingredients in half, including the water. Hope that helps. I made this last night for a church activity. It got great reviews from everybody. Amazing stuff. I was a little skeptical pouring water over everything right before I cooked it, but is is soooo worth it. I made this last night for a Church activity and I got so many great reviews. 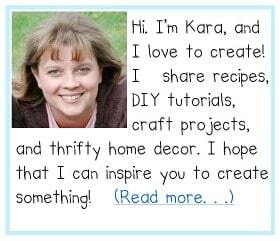 Kara, you made a winner with this one! Love love love! I never thought to make it in a muffin pan. Great idea for making individual serving sizes! How would you modify this for a crock pot? I haven’t tried this in the crock pot, but it should work like the hot fudge version. To make it in a crock pot, spread the cake ingredients in a greased 3 1/2 quart crock pot. Sprinkle the nuts on top. Then bring the brown sugar, cinnamon, and water to a boil and slowly pour over the batter. Cook on HIGH for about 4 hours. Slow cooker temperatures vary greatly, so check it often during the last hour. I was wondering. I completely forgot to put the hot water on top of it. I put it in for 45 mins because I’m using a 8″. And 30 mins into I realized I didn’t put the hot water on top. So I did hoping to save it. Is it safe to say to do a redo? Ughhh. Thank you! What size can of pumpkin? This sounds terrific! It’s just one cup of pumpkin, so a small can would be plenty. Can you use fresh pumpkin instead of canned? As long as you cook and puree it first, fresh pumpkin would work just fine. Kara can you put the chocolate pudding cobbler out there please? Oops, I thought I had linked to it when I mentioned it. I fixed the post. And here’s the link for you: https://www.creationsbykara.com/2009/06/chocolate-fudge-cake.html/ Enjoy! We had just enough pumpkin left over from another recipe to give this a try and it was SO GOOD. Two thumbs up from everyone in my home. I’m a great fan pumpkin! Your recipes all look amazingly delicious. I won’t be waiting for cooler weather to try one of these desserts because here in Texas it’s still high eighty degrees. Can self rising flour be used instead of flour and baking powder? I’ve never used self rising flour, but it would probably work. You would need to omit the salt, because self rising flour has salt added. If you were to give everyone a nice big scoop of this, how many would you say this would serve. Trying to figure if I should double it or not. Tempted to, just to have leftovers. It serves about 8, so if you are serving more than that, I’d double it. Leftovers are great warmed up in the microwave! Since it’s meant to be gooey, how do I know when it’s done? The cake part rises to the top, so I usually poke it with a knife to make sure it’s cooked through. Any tips on making this ahead for a “sunday supper” party? This is definitely one of those desserts that is best served warm, so it might not be best made ahead unless all the guests can heat it up in the microwave. As an alternative, you could try under-baking it a little, then baking it for just a few minutes before you serve it. Is it regular cloves or ground cloves? I figured but I wanted to be 100% sure. I’m new to the whole home made baking stuff. I did make it last night and it was delicious. My husband, who doesn’t like pumpkin stuff, wanted seconds!! So glad to hear it was a success! What if you omit the cloves? You can definitely omit the cloves, it will still turn out fabulously! This looks amazing! Quick question though. It says to serve warm which I’m sure you absolutely want to do. But if you don’t use it all the first time, can it be reheated? And if so, just microwave? Yes, you can heat up the leftovers in the microwave and it works just fine! Going to try this with a 1:1gluten free flour someday and see how it turns out! This sounds so awesome, and grateful it is egg free and dairy free! Hi Diane, how did it come out? I am celiac & would also need to make it gluten free. how did the gluten free version work? Can this be doubled and baked in a 9×13 pan? Yes, you can double and bake in a 9×13 pan. It will definitely need longer to bake. I’d start with an extra 10 minutes and add more as needed. Thanks Jenn! It really is amazing! I just made this, just ate it and it is delicious! Thanks for sharing your recipe.